Got time to do the math on how many wheels there are on this oversize load tractor-trailer moving along the highway? Everything or pretty near everything comes by way of trucks, even trains. And by the way, truckers out there, if you want to read more about trains, you can visit RailPictures (click here), where this great shot by Simon Barber was shared. Is it just because I live in Canada that I’ve never seen anything like this on the highway — the opposite of intermodal transport, as Kevin Beeler put it? Owner-operators and drivers out there, what’s the biggest, heaviest load you’ve put on a flat-bed trailer? So what’s happening in this photo is a train came off the tracks — 8 locos were involved — which was caused by a faulty switch loop. And the one in this trailer picture (above) is actually one of the ones that came out of the cornfield meet gone awry in fairly decent shape. So did you look at that photo above and count the wheels? 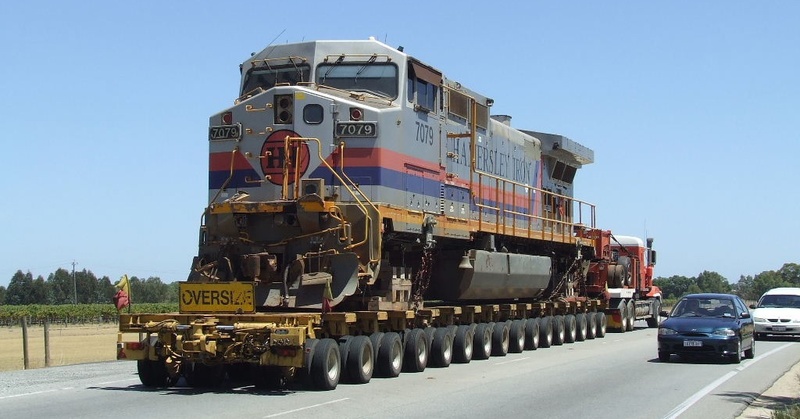 About this trucking method, Bruce Kellet had a bit to say: “All the Pilbara Railway Operators have been successfully transporting rolling stock using this method since their inception the mid 1960s. “There are only two viable methods of transportation, road and sea due to the remote Pilbara Rail network being physically isolated a vast distance from the ex State Government rail network connecting Perth. The heavy axle load and oversize loading gauge prevents this equipment using this trackage. Road is the only option on land at this time. They say everything in Texas is big. I totally agree, but come and visit the rugged Pilbara Region of Western Australia one day.” Well put! Previous Article Gettin er done!